Of all the bizarre quirks of nature, supermassive black holes are some of the most mysterious because they’re completely invisible. Black holes are deep wells in the fabric of space-time that eternally trap anything that dares too close, and supermassive black holes have the deepest wells of all. These hollows are generated by extremely dense objects thousands to billions of times more massive than our sun. Not even light can escape black holes, which means they’re invisible to any of the instruments astrophysicists currently use. Although they don’t emit light, black holes will, under the right conditions, emit large amounts of gravitational waves — ripples in spacetime that propagate through the universe like ripples across a pond’s surface. And although no one has ever detected a gravitational wave, there are a handful of instruments around the world waiting to catch one. NASA Marshall Spaceflight CenterThis illustration shows two spiral galaxies – each with supermassive black holes at their center – as they are about to collide. Albert Einstein first predicted the existence of gravitational waves in 1916. According to his theory of general relativity, black holes will emit these waves when they accelerate to high speeds, which happens when two black holes encounter one another in the universe. 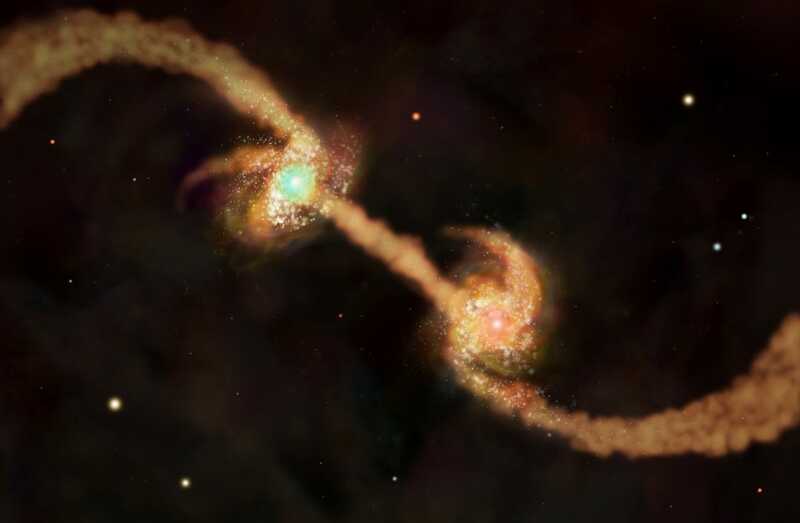 As two galaxies collide, for example, the supermassive black holes at their centers will also collide. But first, they enter into a deadly cosmic dance where the smaller black hole spirals into the larger black hole, moving increasingly faster as it inches toward it’s inevitable doom. As it accelerates, it emits gravitational waves. Astrophysicists are out to observe these waves generated by two merging black holes with instruments like the Laser Interferometer Gravitational-Wave Observatory. Because these waves have never been detected, astrophysicists are still trying to figure out how to find them. To do this, they build computer simulations to predict what kinds of gravitational waves a black hole merger will produce. In the simulation below, made by Steve Drasco at California Polytechnic State University (also known as Cal Poly), a black hole gets consumed by a supermassive black hole about 30,000 times as heavy. You’ll want to turn up the volume. What you’re seeing and hearing are two different things. The black lines you’re seeing are the orbits of the tiny black hole traced out as it falls into the supermassive black hole. What you’re hearing are gravitational waves. “The motion makes gravitational waves, and you are hearing the waves,” Drasco wrote in a blog post describing his work. Of course, there is no real sound in space, so if you somehow managed to encounter this rare cataclysmic event, you would not likely hear anything. However, what Drasco has done will help astrophysicists track down these illusive waves. 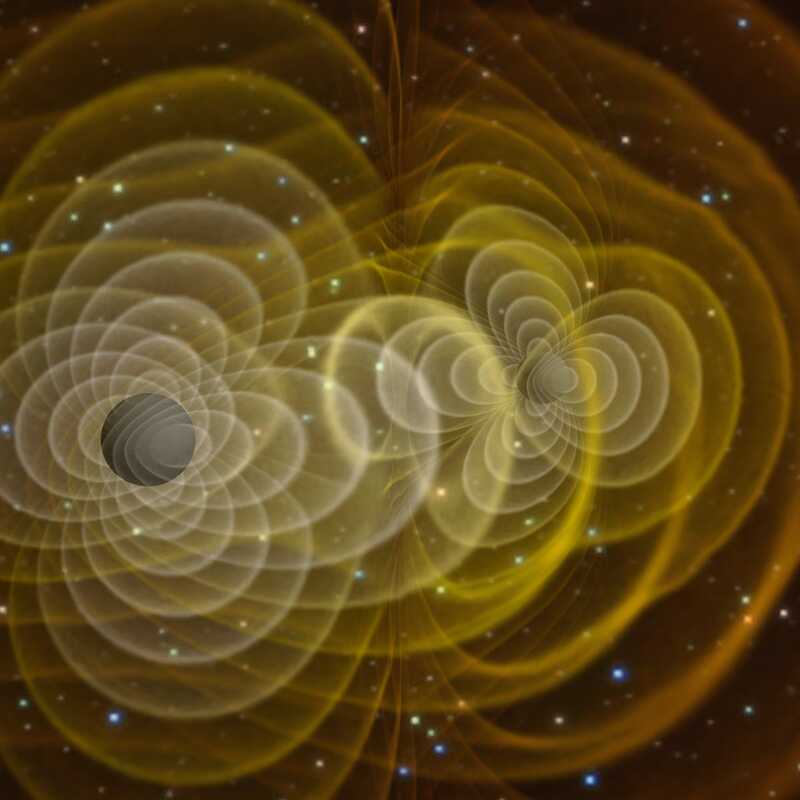 Gravitational waves are similar to radio waves in that both have specific frequencies. On the radio, for example, the number corresponding to the station you’re listening to represents the frequency at which that station transmits. Henze, NASA3D visualization of gravitational waves produced by 2 orbiting black holes. Right now, astrophysicists only have an idea of what frequencies two merging black holes transmit because they’re rare and hard to find. In fact, the first ever detection of an event of this kind was only announced this month. Therefore, astrophysicists are basically toying with their instruments like you sometimes toy with your radio to find the right station, except they don’t know what station will give them the signal they’re looking for. What Drasco has done in his simulation is estimate the frequency at which an event like this would produce and then see how that frequency changes, so astrophysicists have a better idea of how to fine tune their instruments to search for these waves. Detecting gravitational waves would revolutionize the field of astronomy because it would give observers an entirely new way to see the universe. Armed with this new tool, they will be able to test general relativity in ways never before made possible.